Why Do you get a Hip Score? Hip scoring is done to determine weather or not your dog has Hip Dysplasia which means abnormal development which may be inherited by future generations. Good hips are an indication of good build, and are therefore used as a requirement in quality breeding. How do you Get a Hip Score? Hip scoring is done by taking an X-ray of your dog’s hips once they are fully grown (usually around 18 months, but it can be done from 12 months). To do this you will have to make an appointment with your vet. For the dog to hold still during this procedure they are put under a general anaesthetic. The vet takes the X-ray to the Vet Board (with a cheque for 2000/-*) to be “scored”. Results are sent to the East Africa Kennel Club for recording on the dog’s registration and published in our newsletter. 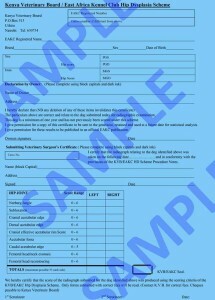 The vet board analyses the X-ray with a panel of experts and issues a “score” which is returned to you via the vet. Readings are done once a month. A hip score is not something you want to get high marks for! The hip score is the sum of the points awarded for each of nine aspects of the X-rays of both hip joints. The best (minimum) hip score is 0 and the worst (maximum) is 106 (53 for each hip). An average score is calculated for all breeds scored under the scheme and advice for breeders is to use only breeding stock with scores well below the breed mean score. It is generally accepted that hip dysplasia is more common in larger breeds, but any dog of any breed can be scored under the scheme. In Kenya The German Shepherd Dog League was the first to introduce the scheme but it was handed over the the EAKC when Rottweilers and Labradors were added. *Charges are set by the vet board, and may be inaccurate.